Obviously, wooden windows coated aluminum from outside is a popular product not only in Scandinavian countries. Both types of wooden windows, Euro' type and Scandinavian standard, can be coated with aluminum from outside. In fact, the construction of wood and aluminum combines the best features of two materials. Wood keeps the warm in and absorbs sound perfectly. Meanwhile, aluminum is a modern high-technology product, that is particularly resistant to external impact. Besides, it is relatively light-weight and does not add additional weight to the window. Important to mention, that aluminum coated wooden windows are long lasting. In spite, it protects wooden window surface well from harmful environmental effects, UV radiation and cold. aluminum profiles are covered with a special paint coating (we have a wide range of colours to offer). Normally, they don’t need any special care. Specifically, wood and aluminum combination is an excellent modern architecture solution. When we produce aluminum coated windows, we use German company GUTMANN GmbH aluminum coating window systems. 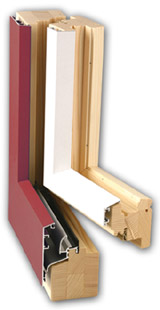 As a matter of fact, we manufacture aluminum coated wooden windows from several profile types. Nowadays, the most popular wooden window profile with aluminum coatings is CORA. Technical characteristics do not differ from wood window characteristics. 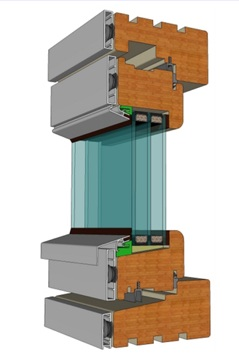 The CORA aluminium profile could be mounted on IV78 and 110M wood euro type window profiles or sliding doors. 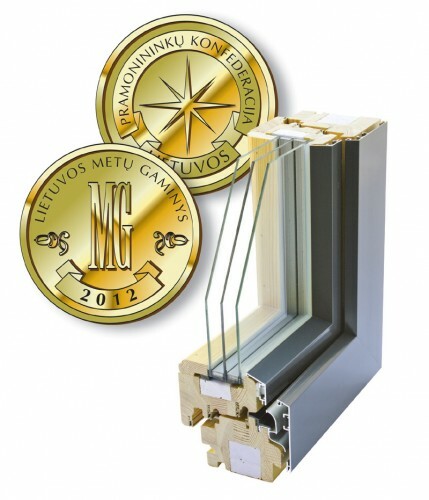 Mainly, the type Euro 110M we modified, are low energy windows. This type of windows is not only safe and long-lasting production. Despite this, it also matches the best heat and sound insulation, break-in prevention and energy-efficient house requirements. Profile can be painted in various colours from the RAL palette. The Scandinavian standard windows can be coated with GUTMANN – aluminum profile and GUTMANN NORDWIN system! As a matter of fact, the name GUTMANN is a a well-known name in aluminum profile producers’ market from Germany. Besides, aluminum coating can be painted in any colour from the RAL palette. Why should You choose wooden windows coated with aluminum? Such production will serve You for decades! Aluminum cover properly protects wooden panel against harmful environmental effects like: UV rays, rain, snow and dust as well. Besides, You won’t even have to think about restoration of windows and doors. Second, aluminum cover does not overweight the windows, so they stay relatively lightweight and at the same time strong. In fact, the general construction works as part of the entire wood window. Third, it is safer – wood and aluminum windows and doors employ a technology, which ensures protection from breaking. Also, a better thermal insulation is the perfect solution for a heat-saving house. We produce very warm wooden and aluminum window profiles, which have extremely high thermal insulation and are easily maintained. It goes without saying, You will not need to repaint or re-varnish for decades and the colour will always stay the same. In addition, we can offer a wide range of colours. Particularly, aluminum clad wood windows and doors can be painted in any colour from a RAL colour palette. Another key point is that the non-standard size or shape is not a problem for us! Our company has implemented many successful projects. Important to realise, that the secret of success – is a satisfied customer! For this reason, all orders are carried out from the beginning to the end, ensuring quality service.